KEM INJECT UWEP is a two part, solvent-free, water moisture tolerant epoxy resin based injection system designed to form a strong permanent bond and seal in cracks in dry, damp or wet concrete and masonry. It is designed to be injected into cracks using suitable resin injection equipment. However it can be easily applied manually in horizontal application due to using flooding technique its low viscosity. For injecting into cracks in concrete or masonry particularly in net or underwater conditions to form a permanent bond or seal preventing water seepage in areas such as basements, swimming pools water retaining structures etc. It is suitable for use in marine environments. Add 3.75 to 4.25 litres of water in 25 kg KEM Mortar HS for pumping or spraying and 4.5 litres of water to maintain the consistency. 1 kg Pack yielding 0.950 litres. KEM INJECT PU 2K is a two part solvent-free, low viscosity high tensile strength polyurethane based system designed to form a strong permanent bond and seal in cracks in dry, damp or wet concrete and masonry. 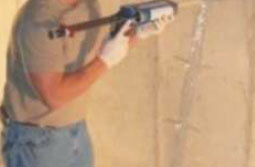 For injecting into cracks for dry, damp or wet concrete or masonry. Due to its good adhesion with sand & concrete, it may be used for seding layer around construction. It can be used for sealing & bonding cracks between or upto 10 mm. 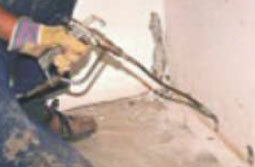 It is designed as a permanent solution to seal and bond cracks in concrete and masonry. Crack widths of between 0.2 mm and 10 mm can be treated depending on requirements. Depends on extent of cracks. KEM INJECT PU 3K is a three part solvent-free, injection foam for stopping water leakages through cracks. 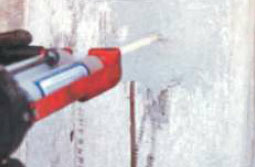 For injecting into cracks for, dry, damp or wet concrete or masonry. Especially as an underlay for poorly ventilated working areas. May be used to form bowl-shaped sealing layers around construction, since it adheres well to sand and concrete (wet or dry). 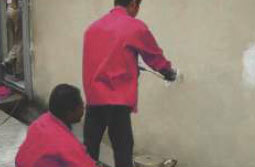 It is designed as a permanent solution to seal and bond cracks in concrete and masonry. Crack widths of between 0.2 mm and 10 mm can be treated depending on requirements. KEM INJECT PU 100 is single component fast reacting PU Injection foam. 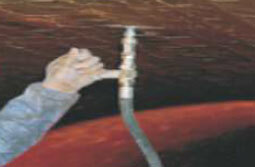 The product is injected in leaking cracks to stop the flow of water. It reacts with available water foaming almost instantly. This help in stopping even a heavy leakage in concrete structures such as water retaining structures, basements, tunnels etc. For sealing leaking cracks in concrete. Depends on type and size of cracks. KEM EPOXY GROUT ELV is solvent free epoxy resins with polyamine hardeners. The grades additionally contain inert granular powdered fillers. It is used for gaps from 0.3 mm to 10 mm. It is used for all grouting applications, especially those requiring chemical resistance and heavy duty resistance to vibrational and other dynamic or mobile loads. Applications include crane and transporter rails, compressors, high speed turbines and centrifuges, rock crushers and pulping machines and other heavy duty equipment. They can also be used for anchoring steel bar with concrete and the annular gap should be within the limits indicated. It is recommended for crack injection and to fill up hollowness beneath impro/ly grouted machine base plates.